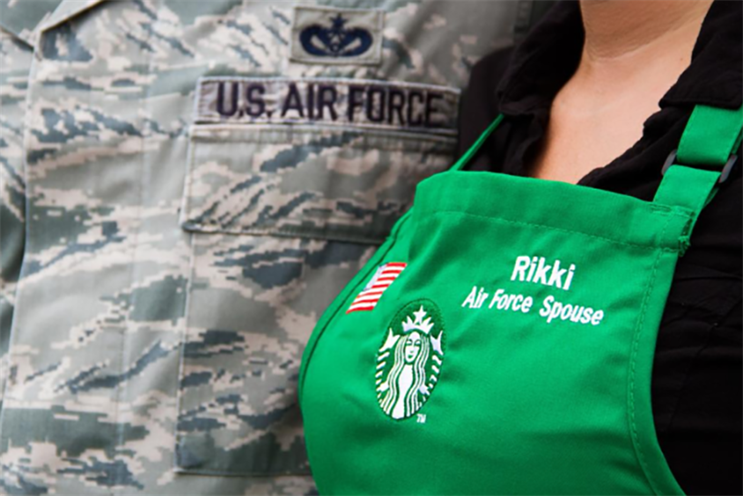 Embroidered flags adorn the aprons of Starbucks staffers who are veterans or military spouses. WASHINGTON — Showing gratitude through action is a common theme across brands and organizations this Veterans Day as companies look to honor those who’ve served. Some companies have made the effort to "look behind the uniform" and raise national awareness of the men and women who serve, said Erin Hazard, SVP, partner, and lead of Fleishman Hillard's military and veterans affairs group. Hiring initiatives have evolved over the past two to three years, she said, "putting the right people in the right positions" to help set them up for success. Veterans have various skill sets they can offer a company, she added, such as leadership and IT and logistics expertise. Events are becoming more local, too, said Hazard, with brands trying to better engage servicemen and women. Hazard said Walmart has hired nearly 68,000 veterans and has made around 1,000 promotions in that space in the past year. "People truly want to move beyond just a ‘feel good’ program," she said. "They want to move in to programs that make a lot of good business sense for service members as well." A Starbucks representative told PRWeek that more than 1,000 veterans and military spouses have been hired following the company’s initiative to welcome a total of 10,000 new staffers. The brand’s goal is to bring on 2,000 additional veterans and military spouses in the next year. "These partners are now identifiable in stores by the embroidered American flag on their iconic green apron, something available only to our veteran and military spouse partners," the representative added via email. National Basketball League and National Football League players honored service members during games this week in the gear they wore and through other initiatives supported by the leagues and specific teams. Both organizations sported updated Twitter photos in honor of the nation’s veterans. Happy Veteran's Day & thank you to all the men and women who have served and continue to serve our country. We salute you!